NASA says part of the cooling system shut down after a circuit breaker tripped on Saturday. (CNN) -- Crew members on the International Space Station may need to conduct spacewalks this week to fix the station's cooling system, NASA said Sunday. Warning alarms awakened crew members Saturday night when a circuit breaker tripped, shutting off power to the pump that feeds ammonia to part of the station's cooling system, NASA said in a statement. "The crew is not in any danger and is monitoring systems and relaxing on an otherwise off-duty day," NASA said. Engineers are reviewing preliminary plans for two crew members to conduct one spacewalk this week to replace the failed pump, and then another spacewalk several days later to complete fluid and electrical connections, NASA said. NASA said the cooling loop shut down around 8 p.m. ET Saturday after monitors detected a power spike in the pump that sends ammonia through the loops. 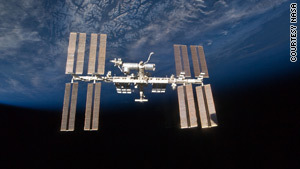 The problem forced other systems on the space station to shut down, NASA said. The alarms came two days after NASA officials warned space debris could pose a risk to the station. Later Thursday, scientists said the debris was no longer a threat. Six people -- three Americans and three Russians -- are on the International Space Station. The station's crew members are conducting more than 100 ongoing experiments in biology, physical sciences, technology development, and Earth and space sciences, according to NASA. NASA says that without temperature controls, the temperature of the orbiting station's sun-facing side would soar to 250 degrees (121 degrees Celsius), while thermometers on the dark side would plunge to minus 250 degrees Fahrenheit (-157 degrees Celsius).